Yesterday I created a few rough versions of my idea of a "vision board meets calendar". I tried a few different layouts which I'll be test driving this month, before reproducing this digitally and printing out for 2018. I tried a few layouts that incorporated the entire month, then some that were more zoomed in and similar to my daily to-do lists. I like the idea of capturing both a to-do list and notes in a daily page, allowing me to think beyond the immediacy of the day's goals and just jot down random thoughts, notes on my skin's progress, etc. A reacquiring theme in my to-do lists is this little box. At some point in my last job I started giving myself boxes to check off and would use a different color as the check mark, making it super clear what was leftover. The gratification of checking off the boxes is such a great feeling. It's the same rewarding feeling I get when swipe away Inbox email reminders of errands I've added to my Google calendar. Checking things off works for me. 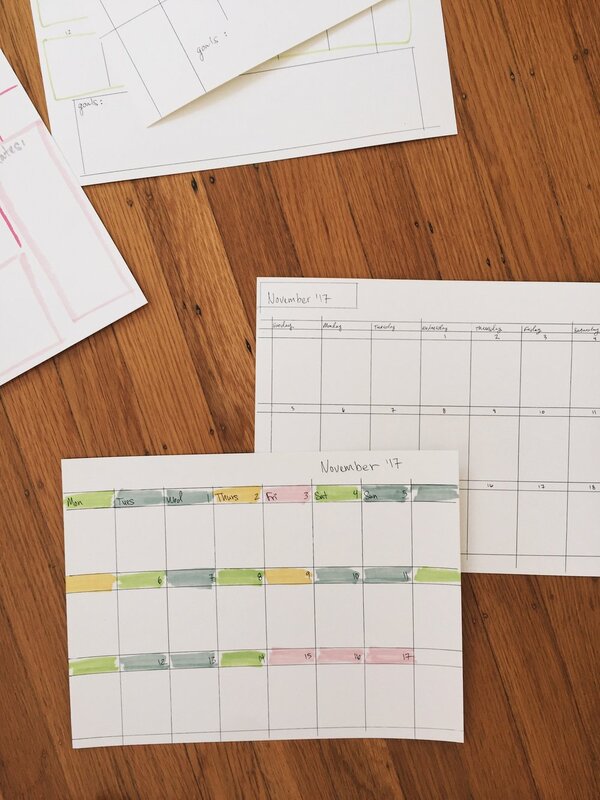 Lastly, I may skip the monthly calendar all together and opt to make an entire 2018 roadmap, with weekly or biweekly sheets along side it, or in a small to-go binder. This may take up an entire wall, but I'm hoping this project also motivates me to get my little office/closet up and running for all of my creative projects.